Have you heard about the new Fortnite Peppers? They're one of several new consumable items added to Fortnite as part of the 8.20 update, and if you find and eat them their effect is two-fold. Firstly, you'll get an instant 5 health boost, in much the same way you would for chomping on one of the Fortnite Bananas or Fortnite Coconuts. However, you can still munch down a spicy Fortnite Pepper even if you have full health already, as their other effect grants you a temporary speed boost - alarm bells will ring and steam pours out of your ears, while your movement speed will go up by 40% for the 20 seconds that follow. See, we told you they were spicy! Neither effect will really give you much of an advantage in battle, but they're still fun to play around with and you never know when you might need that extra bit of health top up. We've been searching around to find these hot red peppers, and bring you all of their locations so you can go straight to the source. The area by the oasis to the northeast of the truck stop is a good place to look, as there are Fortnite Peppers down by the stream as well as on the raised plateau above. Otherwise, the raised hill to the northwest of the main Paradise Palms settlement, or the shack across the road to the west of the race track, are both likely locations. 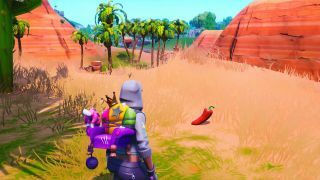 We can't guarantee they will be there every time, especially if other players visit before you, but you should have an excellent chance of finding a Fortnite Pepper if you visit these spots.